The testing was done in the ABS Mark 2 containing a mixture of 95% Argon and 5% Hydrogen gas. A specially- designed, four-turn split helical inductor was used to provide optimal heating to the joint area of the tube assembly. 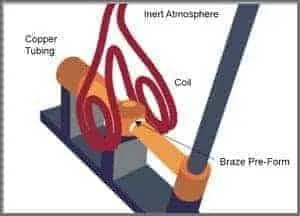 After initial tests were conducted with bare parts and temperature sensing paints to establish time-to-temperature and heating profiles, a temperature of 1450°F was reached in 45 seconds to melt the brazing pre-forms. Successful results were achieved at 1450°F within 45 seconds. Since the heat conducts through the tube assembly, subsequent joints on the same assembly would require less time. Brazing copper tube assemblies is an excellent application for induction heating. 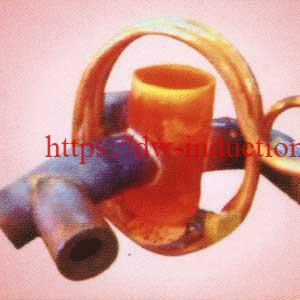 Induction Brazing Copper Tube-Pipe with High Frequency RF Heating System.